UNITED NATIONS, Dec 7 2017 (IPS) - The four Pacific Island nations who are amongst the Least Developed Countries (LDCs) may be falling behind in meeting energy access targets because they are too busy devoting resources towards climate change. The Pacific island nations that are classified as LDC’s are Kiribati, Solomon Islands, Tuvalu and Vanuatu. LDC’s refer to a group of nations formally recognized by the UN as confronting severe structural impediments – they usually also face extensive economic and environmental vulnerability. Currently there are 47 nations classified as LDCs. Nations may graduate from the list if they meet certain criteria. The report highlighted that LDC’s are falling alarmingly behind in their ability to meet Sustainable Development Goal 7 (SDG7) which pledges to “ensure access to affordable, reliable, sustainable and modern energy for all”. Indeed, according to the report, the majority of LDCs populations go without access to electricity. The report stressed that energy is central to everything in development, stating that productive use of electricity is “critical to spur productivity and economic transformation” and ultimately lift nations out of the poverty trap. Currently the energy situation in Pacific Island LDC’s is fairly bleak. For example, according to The World Bank, only 10 percent the population in the Solomon Islands enjoys access to electricity. The story is only marginally better in Vanuatu which has 30 per cent of its population connected. In an interview with IPS, a spokesperson from the United Nations Office of the High Representative for the Least Developed Countries, Landlocked Developing Countries and Small Island Developing States (UN-OHRLLS) said that Pacific Island LDC’s face unique barriers to energy access compared to their landlocked counterparts. “They face some unique challenges such as geographically dispersed populations spread across several small islands, lack of technical and human capacity as well as complex land tenures,” the spokesperson said. Following a similar line of thought, Pradhan said that such barriers have kept Pacific Island LDC’s largely reliant on imported fossil fuels – exposing them to unpredictable and volatile prices fluctuations. The sad irony here is that Pacific Island LDCs are blessed with an incredible abundance of water, wind and solar resources. “Going forward, the only real, sustainable and long-term option is for these nations to invest in these renewable energy sources. But they’ve been limited to date by their geographical remoteness, their financial constraints, a lack of adequate energy infrastructure, technology, and weak institutional mechanisms,” Pradhan said. Pradhan also highlighted that an overlooked reason for slow results in the renewable energy sector is because Pacific Island LDC’s resources are being spent trying to deal with climate change. “Pacific islands are experiencing unprecedented sea level rise… Saltwater intrusion into freshwater lenses can cause sever drinking water scarcity in the region. Kiribati has already expressed urgent need for funding for desalination plants to provide safe water for the 110,000 residents of country, where much of the water has become contaminated by seawater intrusion into groundwater,” he said. The Vanuatu Government’s ‘National Energy Road Map’ outlines a path for the nation to achieve universal energy access to energy by 2030. Already they have an immediate goal to have 65% of their energy come from renewable sources by 2020. They have not only articulated their intentions but actively began to commit to them. 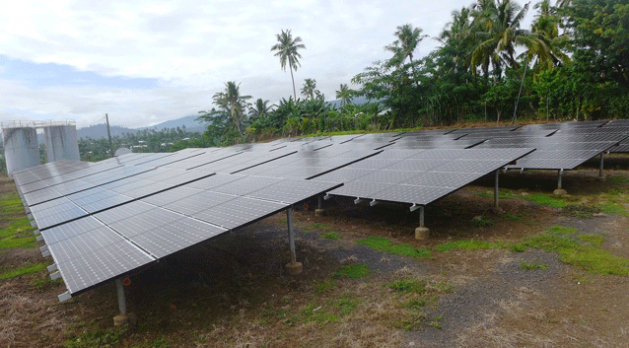 The World Bank earlier this year approved a 4-million-dollar project to deliver solar and micro-grid electricity generators that will give 45,000 people across rural Vanuatu access to electricity for the first time. It is projected that Vanuatu may be the next country to graduate from LDC status. The only countries to have previously done so are Botswana (1994), Cape Verde (2007), Maldives (2011), Samoa (2014). This article is part of a series about the activists and communities of the Pacific who are responding to the effects of climate change. Leaders from climate and social justice movements from around the world are currently meeting in Suva, Fiji, through 8 December for International Civil Society Week.